Though Greece is not the only country in the world with a rich mythology, the lives of gods, semi-gods and heroes in its pre-historical times still have the power of a multicolor, vivid fairy tale that can keep our fantasy alive and thriving. Children learn about it at school and many are named after the fascinating personalities that influenced and inspired the ‘commoners’. The island of Mykonos was often mentioned in mythology, mostly in relation to the nearby sacred Delos Island which is a very important ancient site, visited by millions of people every year. According to the myth, Delos emerged unexpectedly from the depths of the Aegean Sea, with the sole purpose to offer a safe place where beautiful Leto, granddaughter of Uranus (Skies) and Gaia (Earth), could give birth to her twins; Artemis, later goddess of hunt and Apollo, god of music. The reason why Leto was flying over the Cyclades was because Hera, wife of Zeus, who was the ‘illegal’ father of the children, was so furious that had ordered all land to disappear under Leto’s feet! 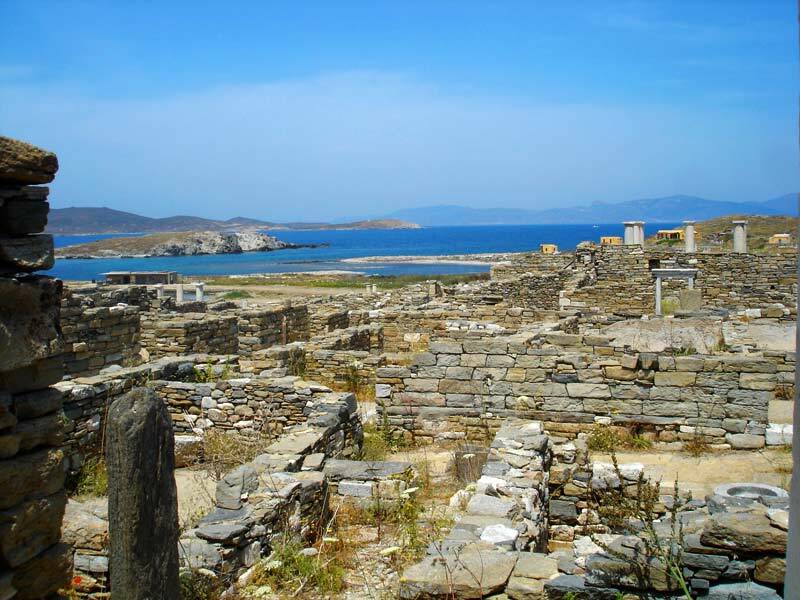 Legend also says that the Cyclades took their name from the Greek word ‘kyklos’, that means circle, exactly because they form an imaginary, protective circle around Delos. As for Mykonos, it is believed that it was named after Mykons, its first ruler and highly esteemed hero, who was thought to be the grandson of god Apollo. It was the island where the great battle between Zeus and the fearful Titans took place; or where, according to another myth, Hercules managed to destroy the Giants, who were supposed to be invincible as long as they stayed under the protection of the holy Mount Olympus. Apparently Hercules lured them to this island and killed them. It is said that the large rocks scattered around the island are nothing but their petrified corpses. 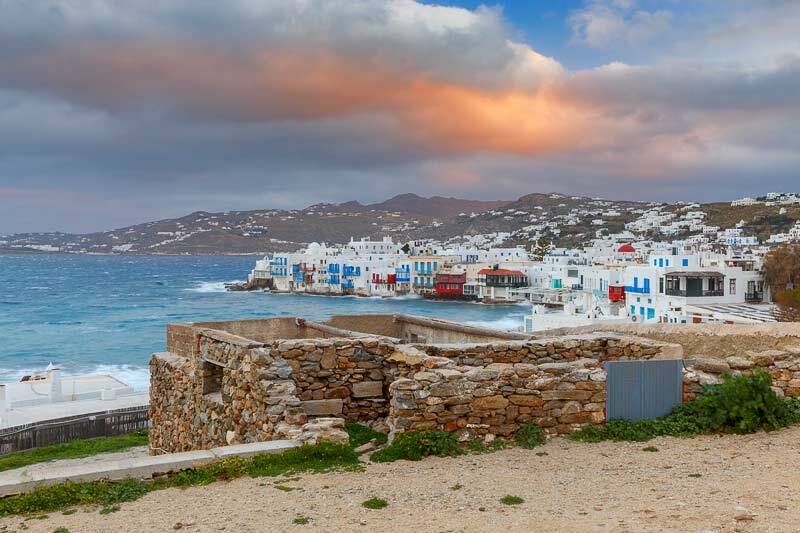 Mykonos was firstly inhabited by Phoenicians, Minoans and Egyptians and later, around 1000BC, by the Ionians who took over the island. The islanders worshiped many gods but their favorites were Dionysus, god of wine, Demeter, goddess of farming, Poseidon, god of the seas and Apollo, the “local” god of music. Even in their deities’ choices it was more than obvious that Mykonians were destined for a life full of fun! It wasn’t until the early ‘30s though that this alluring piece of heaven in the heart of the Aegean Sea started hosting the ‘rich and the famous’, including many artists, who were seduced by its unique beauties and kept coming back, building the island’s reputation as a top worldwide destination. Today, the island that has a population of around 11,000 people welcomes more than 2 million visitors every year; so make sure you will not be the exception of the rule! Just make the decision and the best villas in Mykonos will be here to give you a warm welcome!